"The Azimut Hotel St.Petersburg" is situated in the historical part of the city on the bank of the Fontanka river, at the intersection of Lermontovsky and Rizhky avenues, within 20 minutes drive from Pulkovo-1 airport and 10 minutes away from Baltic Railway Station. The hotel was constructed in 1965 as one of the first skyscrapers in St.Petersburg. 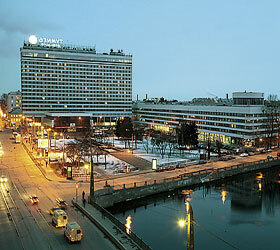 Till 2000 the hotel was named Sovetskaya. From the beginning of the new century it bagan changing. In 2000 complete reconstruction was started, and since 2005 it is run by the Azimut Management Group - the Russian leading hotel network. The hotel offers accommodation in 897 rooms that are located in two buildings - West and East. The Azimut Hotel offers comfortable rooms, buffet breakfast, Wi-Fi Internet, 24-hour room service. All rooms are fitted out with a bathtub, a toilet room, satellite TV, direct phone line, a hair-dryer. For carrying out seminars, congresses, conferences, banquets the hotel has 10 conference halls to offer. The halls have different size and capacity - from small meeting rooms for trainings, teaching seminars, games to spacious halls for large-scale business events. The largest meeting may number 1100 persons. The hotel's team will take care of the whole organization process: think over the concept, book tickets and transfers, arrange the stay in the hotel, organize meeting and registration of the participants, decorate halls for the event, set up all necessary equipment, prepare coffee breaks, business lunches, and buffets, organize entertaining programs and excursions. The Azimut Hotel has several bars and restaurants. The Azimut restaurant is one of the largest restaurants in downtown St.Petersburg built to receive around 550 guests at a time. It is quite popular for holding company events and banquets. The Azimut bar in the hotel lobby is open round-the-clock and offers lots of drinks, refreshments, and desserts. The Vinopiazza and the BeerStadt restaurants are also at guests' service. The following services are provided at the hotel: safe deposit boxes; luggage room; 24-hour reception; bell-boy service for prompt luggage delivery; concierge service including booking of plane and railway tickets, theatre and concert tickets, restaurant tables; transfer and taxi services; souvenir boutique; sauna; beauty parlour; business centre.